As Easter weekend approaches, I thought I’d share a simple recipe to help you amp up your veggies and reduce food waste. 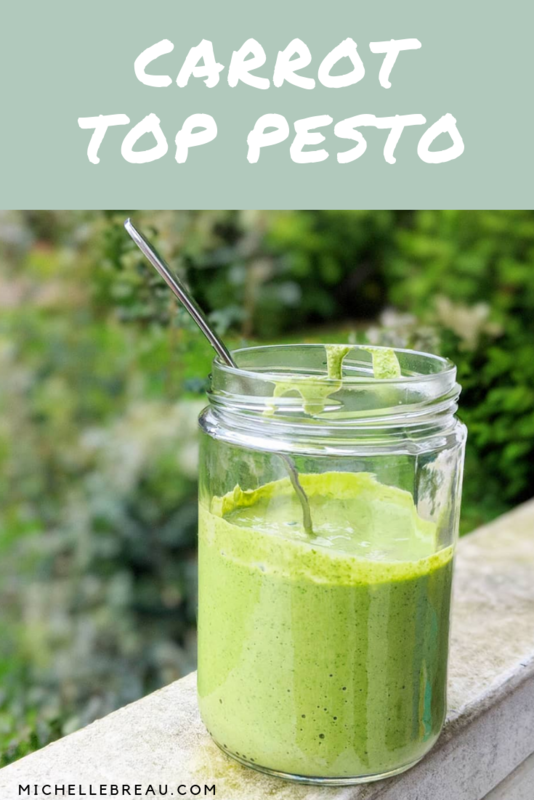 This delicious, easy carrot top pesto recipe! Did you know that the green tops from your carrots are high in calcium, chlorophyll and vitamin C? If you've always been one to toss 'em in the compost, this recipe will change your mind. Save them, blend them, and enjoy the heck out of them. I created this recipe last summer after realizing I had such an abundance of fresh, organic carrots both in my own garden, and in my weekly CSA veggie baskets. The tops were the most beautiful bright green, and it seemed that everyone I knew was just tossing them away. I researched their health benefits and it turned out they were super nutritious! I am all about reducing food waste by using the part that is most often thrown away - ESPECIALLY if it’s good for you! So here we go - Feel free to spend your long weekend dyeing easter eggs and whizzing up your carrot tops. Enjoy! Simply combine all ingredients in your blender and blend until smooth. Pour this over rice, roasted veggies or your protein of choice to add a punch of flavour, phytochemicals and prebiotic fibers that your microbiome may not be used to! Don't forget that our gut bacteria thrive on a diverse array of plant fibers, so switching it up with something more unique like carrot tops isn’t a bad idea! Have a great long weekend, internet friends!